I didn’t think I would like Pinche’s Tacos very much, and indeed I did not. It isn’t personal. The staff seemed friendly. I felt that they made an effort to take care of me and Carmen, their customers for dinner this evening, and to give us the best food they could. It wasn’t bad. But I don’t like Pinche’s Tacos. The Supreme Court Justice of taco bloggers, Bandini, rates his taco experience on a scale of one to five. When setting out to survey the tacoscape one must commit early to whether or not will adopt a quantitative rating system. I opted not to follow this precedent, so I have to rely on mere words to express my dissatisfaction with Pinche’s Tacos. But I don’t think Bandini would like Pinche’s Tacos either. There used to be an outpost of the small Campos Burritos chain in this small freestanding restaurant next to the Helms Bakery complex, and the contrast between the Campos that was, and the Pinche’s that is, exemplifies the transformation of Culver City from a fairly modest community into a destination for dining so allegedly hip that even the New York Times deigned to raise its monocle and take notice. Those who know me will confirm that I am a Campos Burritos partisan, and I mean that figuratively as well as literally. The unassuming, inexpensive, authentic, unselfconscious, and tasty Campos Burritos sensibility pleases me greatly. The overpriced, self-referential, and cute Pinche’s is as if formulated to offend me – a farce of a taquería in the place where the real thing once stood. Check out the reviews on Yelp! and you’ll see that most of the favorable reviews sound like they were written by douchebags. 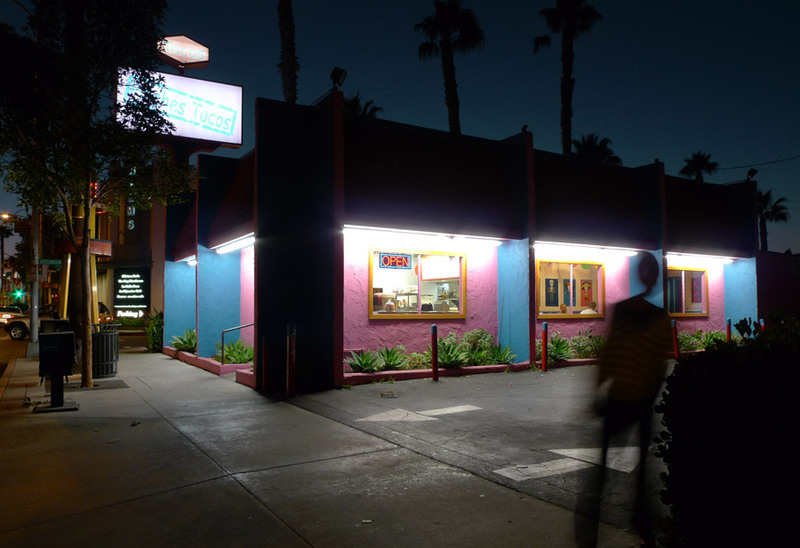 Pinche’s took Campos late-midcentury-generic taco building and painted the outside bright pink and purple; put up a sign with their cheeky name, and topped it with the word “tacos” in glorious Comic Sans; and filled the inside with an admixture of kitsch and camp: real Lotería cards, humorous satirical Lotería cards, authentic Day of the Dead memorabilia, a faux-vintage “Wanted” poster for the bandit Emiliano Zapata. They were playing Gael Garcia Bernal’s ironical cover of “I Want You to Want Me” when we walked in (which was a nice touch). I ordered one each of the carne asada, al pastor, and carnitas tacos. Price for each was between $2 and $3. Sounds reasonable enough, but then do the math: our order of six tacos, a Jarritos, and a fountain Coke came to $21.79. At a taco truck, this order would have cost about $9 and tasted better. Our food was kindly brought to us. I noticed that each taco had a different salsa – a good sign that the tacos are being thoughtfully curated. I noticed the interesting single-ply homemade tortillas – they have a sort of spongy thickness that reminded me of that bread at Ethiopian restaurants. They lack tensile strength. These tortillas did fine through the first taco but tore on the second taco and failed catastrophically on the third. 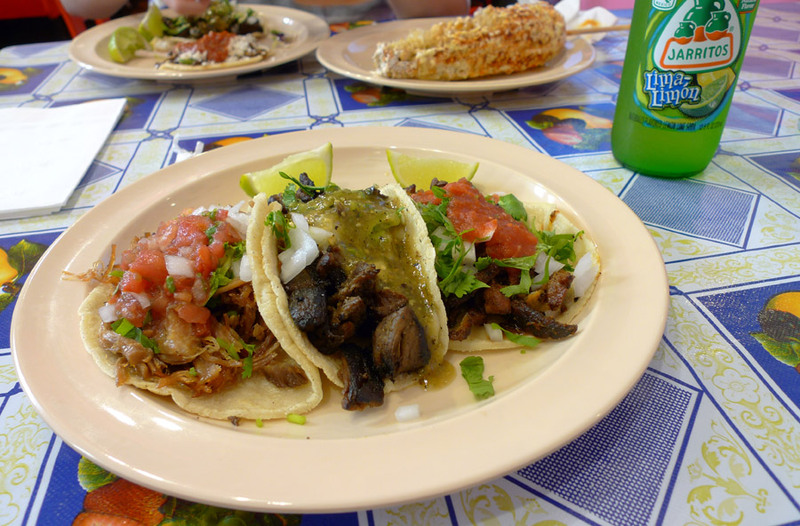 I ate the carnitas taco first, and enjoyed the meat – it had some substantial toothiness to it that one might even call tough, but which to me only enhanced enjoyment; and the meat was flavorful, tasting of citrus and pork. But I did not like the salsa – very chunky and watery, very cold, dominated by tomatoes. A constant stream of dirty salsa water dripped from my taco onto my plate, threatening to drown the carne asada taco. In my opinion, a taco should be a non-leaking and dry thing. Leaking tacos are about as cool as leaking diapers. I washed my hands vigorously after I came home. Next I ate the steak taco. This was truly a taco of steak, as it was impressively above average in size, and the steak chunks were big and cuboid and unmistakeably steaky in flavor and texture, with the serious chewiness you find in American-style steaks. The meat seemed to be of the same chewy cut often found in Peruvian “Lomo Saltado” dishes. The steak was smoky from grilling and seasoned with plenty of cumin. Pretty good stuff, although not what one expects in a “carne asada” taco. The salsa verde was good and peppery, but left me wishing for some spiciness. The al pastor was acceptable, dry rubby in character, with clove and cinnamon conspicuous in the mix. The tender pork bits were sliced thin. The red salsa on this taco didn’t do much for me. This taco’s final act was catastrophic tortilla failure halfway through consumption. These spongiform tortillas need some serious attention. Aside from the supersweet chicken mole octoparrot taco that Carmen ordered, upon consideration, I have to acknowledge that the meats at Pinche’s Tacos were reasonably good, and my account of what I experienced there doesn’t seem to justify the strong feelings of disappointment that Pinche’s inspired. Maybe half-hour’s writing about Pinche’s has mellowed my ire. Maybe I should recant the oath I made two hours ago to stop eating bad tacos and only eat good tacos from now on. I don’t know, but I do know that if I go back to Pinche’s, I’m going for the burrito. Ooh, burn.